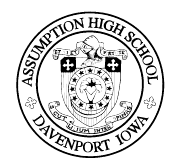 Congratulations to the Assumption jazz choir, Knight Notation! 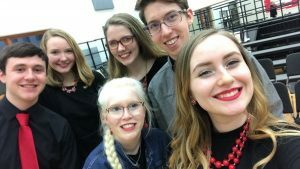 On February 4th they attended the IHSMA State Jazz Choir Festival at North Scott H. S. in Eldridge and earned a Division 1 rating from all three judges. On February 15th they will participate in the Solon Vocal Jazz Festival at Solon H. S. in Solon, IA. The members include Nathan Seutter ’19, Madeline Murphy ’21, Abby Schauer ’19, Jon Herrington ’19, Kelly Anzola ’19, and Melanie Comer ’19.